MyQNAPcloud was working fine however now i can not connect with it anymore. I would like to remove it and use the wizard to set it up again. 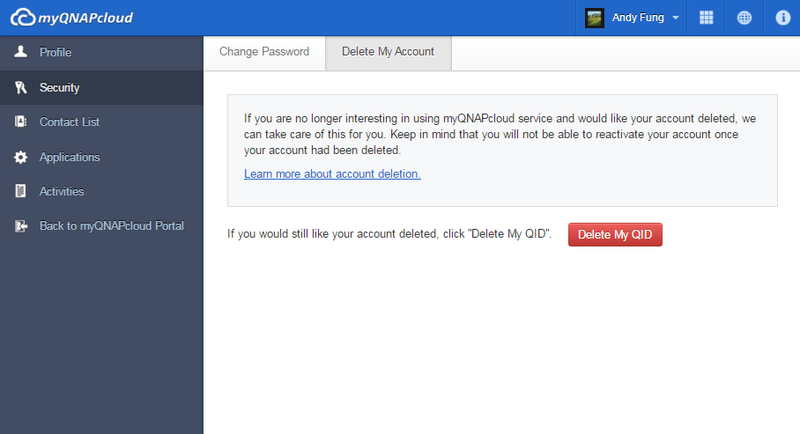 However it seems i am not able to remove the myQNAPcloud service . Does anyone know how ? Nothing to remove. Impossible to guess what does no longer work base on the information provided. - Check VPN (it's enabled again without let you know). Report what does not work. Indeed i tried to sign off however this does not work. I get the message "the server is busy try later". Ofcourse I did not use the server with any other program at that time. Did happens every time when i try to log out. I'm gone from this forum till QNAP stop wasting volunteers' time. Get help from QNAP helpdesk instead. Dear QNAP, kindly fire your clueless incompetent forum "admin" And while at it, don't forget the webmaster! gianluca.seno wrote: I've the same problem! Worked a treat! Many Thanks!!!! schumaku wrote: Nothing to remove. Impossible to guess what does no longer work base on the information provided. QNAP TS-269L - Always running the most up to date Firmware! Window 10 x Four Machines. i'm not able to sign-off in the myQNAPcloud App on my NAS. I always get the message about the Server is busy. Is it possible to force the logout or to remove this myqnapcloud-DDNS? I already deregistered my qnap on the myqnapcloud-website, because my qnap wasnt able to connect to the server. Worked a few weeks and than stopped. Didnt change any router config or else. Message: [Network & Virtual Switch] Failed to update DDNS "myQNAPcloud"." If you need more information please let me know! go to myqnapcloud site, and unregister your myqnapcloud devices there. when qnap is booted up (properly booted up, you got to wait a while for everything to load first, usually like 10minutes or something once it says it just got back up), then go myqnapcloud in qts and disable that service. I already found that what you posted, but it didn't help, so i searched further for hours. I already rebooted several times, but nonetheless i tried it again, waiting a little longer....didn't help. I already deregistered my qnap on the website. And still i can't deactivate that service and i can't sign off myQNAPCloud App. In "My DDNS" i can click on that Button to turn it off. Than it works a while and after that i just says "No connection to the Server possible. Check your internetconnection and try again (Errocode: -11)"
But my NAS does have Internetconnection. I can do a wget connected via SSH and it can download Apps and install them. I can't delete that Service only new ones. Is there no way to force a shutdown of that service? you are using the latest stable firmware right? I will try those hints and old guide later. If i succeed i will definitly let you know. And yes i'm using the latest stable firmware. So i contacted Qnap Support. They were very busy and it took a few days. The engineer wanted some Dumpfiles from the Helpdesk App. But the Helpdesk App didnt work properly too. Again saying there ist no Internetconnection. But there was. My webservers could still put the backups there and i could connect via the Qnap Apps on my smartphone. The Engineer wanted a screenshot from my DDNS under Network-virtual switch. And i looked a bit closer there. Network Adapter 1 was connected to the Internet. It was the Standardgateway. So i activated port trunking and didnt connect the virtual switch to anything. I opend myqnapcloud -> DDNS and bam! it checked i did already deactivate that DDNS Service via the website and the DDNS deactivated itself automatically on my Qnap. But still...its strange that everything worked and took the adapter with the internetconnection. Only myqnapcloud seems to have used the other Adapter without internetconnection..maybe through the virtual switch? Wrote that to the Engineer maybe they can check if there is somewhere a bug in myqnapcloud and virtual switches.